The Virtuix Omni prototypes have been out for awhile now, making waves with demo videos sprinkled on the internet and its skyrocketing success on Kickstarter. However the latest version of the Omni made its way to CES 2014 where I visited the booth for a quick eyes on demo with the brand new machine. The first Omni prototype needed a Microsoft Kinect sensor bar to keep track of the user’s walking and running movements. The latest version however, uses integrated software and hardware – or more specifically, three rings of capacitive sensors found under the base providing a more seamless experience. Special shoes made of the same material as the frictionless concave Omni base, (it’s not actually a treadmill), help ensure players can move with a normal gait. Virtuix CEO Jan Goetgeluk noted that one of the goals of Virtuix is to “mimic a natural step” and make the whole experience as immersive as possible. Players are also strapped in with a harness to help ensure a normal gait, in addition to providing extra support and safety along with a hands free experience. If you’re wondering whether or not the straps are restrictive, take a look at the video above of the demo – it’s pretty apparent that the user is going nuts spinning and waving the gun around without looking like he’s having a hard time killing headcrabs from Half Life 2. The machine itself also isn’t as big as I thought it would be – plus it’s much quieter than a real treadmill. The Omni waist ring is also adjustable to various heights – the shortest person can be 4’8″ and the tallest, 6’5″ with weight supporting up to 285 pounds. The support belt and shoes also come in different sizes. As amazing as the Omni is, there are some caveats – though none that are entirely earth shattering. First up, you need a head mounted display – like the Oculus – but it must be bought separately. Fortunately, it can be whatever display you want. You’ll also need to get your hands on a wireless controller – be it a PS3 controller or Xbox 360 controller. The Omni is also not console compatible, which is to be expected since a lot of other virtual reality devices aren’t yet either. However, the incredible upside is that you can plug its simple 2.0 USB cable into a PC and play any game you want. Any game at all. It works best with first person shooters, but you can even run around playing first person RPG’s or even third person, though it might be a weirder and perhaps less enjoyable experience. If the latter type of game still peaks your interest, Virtuix is also offering an Omni Rack which can hold your mouse and keyboard, or any other peripheral, where you can simply use the Omni without a head mounted display so your choice of games remains unlimited. So far, the Omni seems like a brilliant device that’s not only affordable but incredibly adaptive and a healthy option for gamers who sit all day. 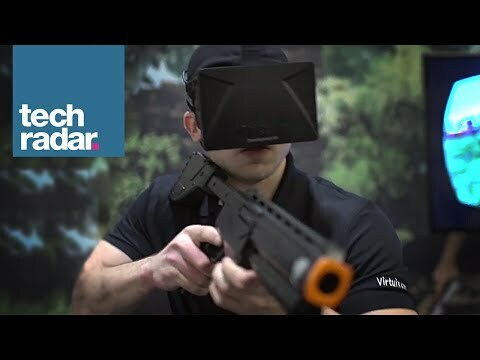 Along with console compatibility in its sights, Virtuix will also eventually incorporate hand tracking so you’ll actually be able to move your hands and see it in-game. When this happens, there’s no stopping the Omni. You’ll be able to explore and fight your way through games with your whole body instead of simply sitting. The Omni is priced fairly at $499 (£302.92, AU$554.88) and the company is still accepting preorders with the product shipping out in June of this year. There is still a lot to be said and tested with the Virtuix Omni but as of now, I can confidently say it’s an extremely promising device.